This little table sits next to my reading nest. I have no idea how all those books got there. Ok, well maybe I know how a few of them got there but I think other books have either snuck onto the pile of their own accord or the books that were already on the table are reproducing. Isn’t that an interesting thought? Imagine what the results would be if A Girl is a Half-Formed Thing hooked up with Guermantes Way. Actually, that is kind of scary to think about so let’s just talk about what I hope to read in December which includes not a few of the books piled on that table. Why not begin with Eimear McBride’s A Girl is a Half-Formed Thing? I am over halfway through it and liking it very much. I would have been done with it by now if I had been able to renew Narrow Road to the Deep North. I will be returning to it very shortly and expect I will soon be turning the last page. Sadly, Guermantes Way slipped by the wayside, getting very little attention. It got some and I can honestly say I am enjoying it much more than when I first attempted it a number of years ago. But because I have been inundated with library holds, I could not give dear Proust very much attention. I hope December will allow me to rectify that. Also falling by the wayside in November were Keats’ letters. I plan to get back to those too because I will be making a little study of Keats in 2015. And The Magicians by Lev Grossman has also suffered neglect due to all those library holds. It too is a library book but it is one I can renew which means its deadline is a bit farther out. Still, I don’t want to let it linger too long and I am about halfway through it so it shouldn’t take too much effort to finish up. Remind me I said that come January. I had really been looking forward to reading Women in Clothes edited by Sheila Heti, Heidi Julavits and Leanne Shapton. It’s an exploration of the things we ask ourselves while getting dressed each day. I expected there to be more analysis and social commentary, more discussion about appearance and body image and all that. There is some of that but it is mostly light and girlfriend-y and I am not sure I will keep going with it. I must admit to having a good laugh as one woman described her style as a “post-apocalyptic Audrey Hepburn My Little Pony sort of thing.” Since there is no photo that leaves one to imagine all sorts of possibilities. I recently began reading Claudia Rankine’s newest book Citizen: An American Lyric. With all of the jaw dropping racist mess the Ferguson police and legal system have made of Michael Brown’s murder by a white police officer, Rankine’s is a timely book about the sorts of racism that take place on a daily basis in America. It is one of those wonderful cross-genre sorts of books that is easiest to put in the category of essays but these are no ordinary essays. Also on the piles to read in December is a review copy of Dirty Chick, about a couple who leave their urban life to try farming without ever having had any experience. From the library to read under deadline is F by Daniel Kehlmann and The Sense of Style: The Thinking Person’t Guide to Writing in the 21st Century by Steven Pinker. Pinker is a linguist and cognitive scientist so I am not sure why he wrote what amounts to a style guide, but it has the potential to be interesting if for no other reason than it might have a different point of view than your standard writing manual. I’m also in the mood for some good science fiction. I’ve been hearing so much about Ann Leckie’s Nebula and Hugo Award winning Ancillary Justice that I could no longer ignore it. The story is about Breq, an artificial intelligence that used to control a huge starship that is now stuck in a human body. She’s out for answers and revenge. Fun! And just in case all that is not enough, I also have on hand another Euripides play, Iphigenia in Tauris, because, you know, it would be horrible to not have enough books to read. Don’t laugh, I have a two-week vacation remember? So much time to read. I can hardly wait! Sounds like you’re in for a fabulous December/vacation. Ahh, if only minister’s wives could take 2 weeks off in December! I’m hoping to finish two books and maybe read a couple of Penguin’s be Christmas Classics this month. Emily, I suppose it is one of the busiest times of year at your house. Bookman is super busy too but a university library when all the students are on break? Not so much. I am fabulously lucky! Enjoy your own reading too! Your table is a beautiful sight! Usual excellent range of books and soon enough time to read them! Recent reads include a wonderful book Under Another Sky which is a book about the Romans in Britain and is a mix of travel book, archeology/history and cultural history – I really enjoyed it. Also a brilliant crime novel from 1947, In A Lonely Place by Dorothy B Hughes (Bogart starred in the 1950 film version)…its about as noir as fiction can get. Also a couple of Simenons. Some good reading! Under Another Sky is by Charlotte Higgins. Hi Ian–I have heard many good things about Dorothy Hughes and have read a short story by her which I liked–I have several of her books on my own TBR pile–need that gentle push to pick this one up–when ‘brillian’ is attached to a book it is a must read….have added the Higgins book to my wishlist, too! I love the sound of Women in Clothes – enjoy your reading! 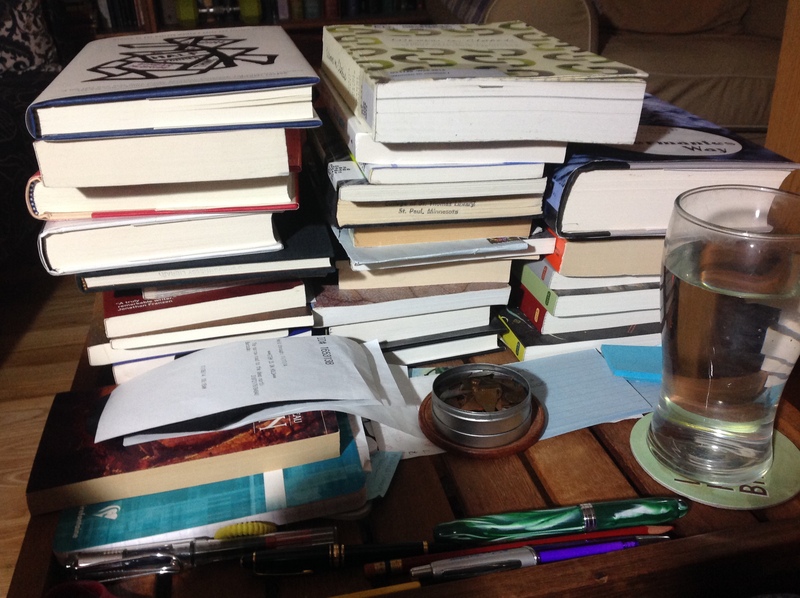 Danielle, Bookman asked me the other day if I needed a bigger table. I told him absolutely not, it would just encourage me to add more books to it. I have been really good the last few weeks about not adding more books to my library holds list. I am going to try and make it through the end of the year before I add more in hopes of getting our from under so many due date deadlines. Yes, sometimes you do need to start new books in spite of having a lot on the go. It sort of helps refresh everything a bit I think. Have fun figuring out your own vacation reading! Isn’t it amazing how in a bigger space you think now you have room to have that space, but in the end you just end up filling it up with more stuff!! I am going to be all about streamlining in 2015! Streamlining, a good goal. I wish you luck! Two weeks to read… that sounds lovely. Enjoy your time off. My Book Strings, oh I will, thanks! You are very disciplined to manage so many books at once. I can do three or four at most. Otherwise, the ones I’m enjoying edge out the ones I’m enjoying slightly less and then I never get around to forging on with the ones that didn’t make a great first impression at all. It does sound as if you have a lovely variety here, though, and I’ll be most curious to hear how you liked A Girl Is A Half-Formed Thing! Ancillary Justice just went on my reading list, I’d sort of heard about it but not what it was about until your post here 🙂 I have to get some books for Christmas, so I might treat myself and hope one or two of them I can read by Xmas. Ancillary Justice looks so interesting, doesn’t it? I have Dirty Chick on request at the library too. You are so bad for my reading list. So good for it too 🙂 I have to return the favour one day! Enjoy reading on your lovely long holidays ahead of you, Stefanie. I agree with the commentator who said you show us spines of your books in the photo, I think I’ have damaged my neck trying to guess what the books could be! Susan, Ancillary Justice looks so good. I was going to wait until next year but I decided it would make good vacation reading and there was no reason to wait 🙂 Sorry to be bad for your reading list. Or maybe I am glad? 😉 Check out my reply to Grad above for what other books are on the table. I hope you enjoy your holidays too and I hope you are continuing to heal! You have such an eclectic collection there, should definitely give you plenty to think about over the holidays. cirtnecce, variety is the spice of life as the saying goes! Vacation is definitely near though I am already worried about it going by too fast and it hasn’t even begun yet! Oy.